Bill Papastergiadis says ‘Today marks a watershed moment for the Greek Community of Melbourne (GCM) . The agreement to allow members of NUGAS Vic to become automatic members of the GCM is reflective of the “open door” policy of the GCM. This agreement will further unify the organisations. It will allow for greater collaboration and foster the development of the future leaders in our community’. 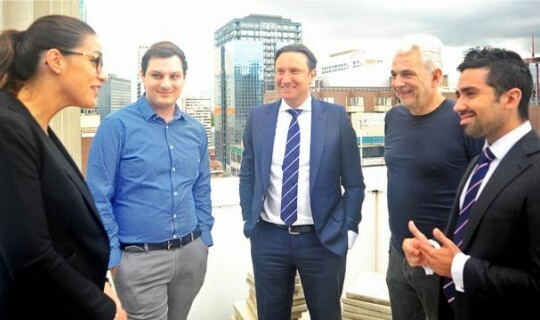 The agreement was officially announced on Friday, during a meeting of the President of NUGAS Vic Mr. Tass Sgardelis with a delegation of the newly elected Board of Management, consisting of the President Mr. Bill Papastergiadis, General Secretary Mr Costas Markos and Directors Mr. Phillip Vassiliadis and Ms Angela Georgalis. The agreement is the result of discussions between the two organizations that took place during the last couple of years, as it was a mutual desire to further strengthen their relationship. “I think it is very important for the Greek-Australian youth to get involved with the Greek Community and be aware of what is happening within the Community. We discussed at committee level the different ways to become actively involved and to work as partners and not work in isolation. We believe that the Greek Community is the most significant Greek organisation in Melbourne and we wish to work more closely in the future,” Mr Tass Sgardelis said. GCM Board member and former member of NUGAS Vic, Mr Phillip Vassiliadis, noted that with the completion of the Greek Centre that NUGAS Vic must be engaged in more ways than simply using our building. Mr Costas Markos, GCM General Secretary, described the agreement as a natural development as NUGAS Vic has been housed in the GCM building for over 30 years. He also underlined the fact that for the first time all the members of the GCM Board of Directors were born in Australia. "This is a tremendous achievement," he finally noted.